After Mowzey Radio feeling sweet and vows not to apologize to Promoter Balaam on defamatory statements he made against him at the Best of Radio & Weasel album launch as stated by ultimatum he was given, Balaam seemed to be very serious about the issue and he has finally dragged Mowzey Radio to court. 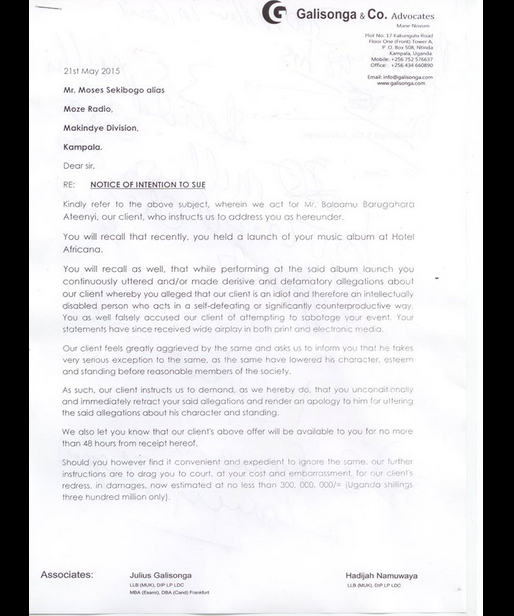 Also Read:VERBAL WAR: Radio & Weasel Versus Promoter Balaam Update. Howwe has learnt that last week Radio was issued an intention paper through a city advocate known as Galisonga and Company Advocates but as usual Radio saw that as a wastage of time.